"Ensuring affordable and quality healthcare to the population is a priority for the government and we are committed to achieving zero TB deaths and therefore we need to re-strategize, think afresh and have to be aggressive in our approach to end TB by 2025"
Elimination as defined by the World Health Organisation (WHO), means that there should be less than 1 case of TB for a population of a million people. In view of the current TB burden in India, there is a great deal that needs to be done if elimination is to be achieved by 2025. The National Strategic Plan 2017 - 2025, sets out the government plans of how the elimination of TB can be achieved. India accounts for about a quarter of the global TB burden. Worldwide India is the country with the highest burden of both TB and MDR TB. 2“Global TB Report 2017”, WHO, 2017 There are an estimated 79,000 multi-drug resistant TB patients among the notified cases of pulmonary TB each year. India is also the country with the second highest number (after South Africa) of estimated HIV associated TB cases. For more see TB & HIV in South Africa. In 2016, and as a result of new information being available, the GoI together with the World Health Organisation revised upwards the estimates for the burden of TB in India. The RNTCP is responsible for implementing the GoI’s five year plans to combat TB. 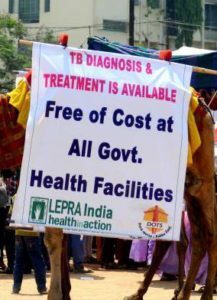 For the five year National Strategic Plan for 2012 - 2017, the vision of the government was for a TB free India through achieving Universal Access. This was to be through the provision of quality diagnosis and treatment for all TB patients in the community. This was a major policy change. The policy change meant extending the reach of RNTCP services to all people diagnosed with TB, including those with drug resistant TB, as well as those seeking treatment in the private sector.The new policy also included improving the quality of existing RNTCP services. the extension of RNTCP services to patients diagnosed and treated in the private sector. The Joint TB Monitoring mission (JMM) of the RNTCP had brought together a number of national and international experts and organisations in 2014. They were to generally review the progress, challenges, plans and efforts of the RNTCP to control TB. The implementation of the NSP 2012 - 2017 was one of the areas looked at. There continued to be concern about the standard of care provided in the private sector. Delays in diagnosis, the use of multiple non standard regimens for inappropriate lengths of time, the lack of a way to ensure the full course of treatment was being taken, and the recording of treatment outcomes were just some of the issues. www.searo.who.int/india/publications/en/ This was subsequently endorsed by the Ministry of Health and Family Welfare. Among other points this acknowledged that patients would need to be treated by private providers, rather than simply demanding that unwilling patients should be referred to the public sector. In 2016 the RNTCP published revised technical and operational guidance. The new guidelines, the RNTCP Technical and Operational Guidelines for Tuberculosis Control in India 2016, did not replace the previous guidance (the Standards of TB Care in India), but they provide updated recommendations. They also make it absolutely clear that the guidance applies to the private sector as well as the public sector. One of the main changes in this strategic plan, is that the emphasis is going to be on reaching patients seeking care from private providers. So this NSP builds on the work already done with the new RNTCP operating guidelines. The RNTCP will also be helping private providers to provide quality care and treatment, rather than encouraging the private providers to send their patients to get care from the RNTCP. The cost of implementing the new NSP is estimated at US$ 2.5 billion over the first three years. This is a large increase over the budget for the current NSP. The NSP plans to provide incentives to private providers for following the standard protocols for diagnosis and treatment as well as for notifying the government of cases.5“India’s ambitious new plan to conquer TB needs cash and commitment”, The Conversation, October 4, 2017 https://theconversation.com/indias-ambitious-new-plan-to-conquer-tb-needs-cash-and-commitment-84821 Also patients referred to the government will receive a cash transfer to compensate them for the direct and indirect costs of undergoing treatment and as an incentive to complete treatment. This has already been trialed in some pilot projects. "When I visited the largest slum in Mumbai with over one million people, I saw a model of care that seems to work whereby private practioners are empowered to detect and report TB cases through the support of an NGO and patients are mobilized to access TB services through the incentive of vouchers"
As more people learn about and take the TB drugs, so there is an increasing need for the supply of drugs to be well organised. Drug shortages can have a devastating effect on people with TB who are unable to take their drugs correctly. Also, as these people once again become infectious, so they can spread TB to other people. In 2018 it was reported that there was a complete “stock out” of TB drugs in a district in Odisha.8“TB drug shortages in Odisha”, August 2018, Personal communication If this information is incorrect, or if there are drug shortages in other areas, then please can you contact the author of this page using the comment facility at the bottom of this page. So has India turned a corner? Some people believe that India has dramatically turned the corner on TB. The government is calling for the elimination of TB by 2025, and there is a new National Strategic Plan 2017 - 2025 with ambitious ideas endorsed by the government. The financial resources for TB control for 2017 - 2025 are to be doubled, the diagnostic tool CB-NAAT is to be rolled out across the country and the two new drugs bedaquiline and delamanid are also scheduled for broader rollout. First and second line drug susceptibility testing is in use or at least on the agenda. Also, patients with TB are tested for HIV and patients with HIV are tested for TB. Drug treatment is moving from intermittent therapy to daily fixed dose combinations. The private sector is to be engaged and the Prime Minister has added his voice to the crescendo of endorsement. But can all this be achieved? Where is the sense of urgency as the first year of the NSP is completed? Only time will tell as progress is monitored through a series of impact indicators. and the treatment success rate.